This week marks the beginning of what I think of as "birthday party season." It seems that Max's friends all have birthdays around the same time of year. But when I put them up on the calendar, they're really spread throughout the year. The "season" consists of one birthday per month from June through November. I really don't know what I'm thinking. 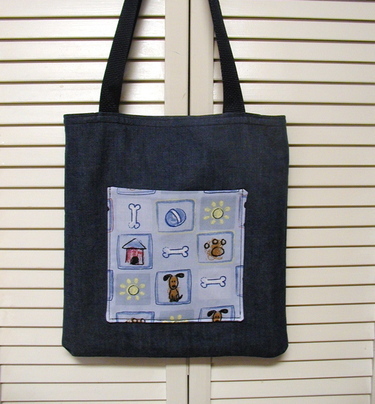 The outside is denim, the inside is lined with mattress ticking, and I have a bunch of fun prints to use as the pockets. The present this time is a sewing frame, although most will get flower presses. Posting has become sporadic, as you can tell. I'm not quite sure why. I suppose the real reason is that I've been trying to work more, so I guess that will continue. (Darn that work, it sure gets in the way of crafting!) Another reason is that I've been getting lots of orders for the pen holders in my etsy shop, that's been lots of fun! Oh! One more piece of news! I finally decided to sign up for a week-long quilting course given by Weeks Ringle and Bill Kerr, owners of FunQuilts and contributor to whipup! It turns out they're coming to our little town in July (advantage: cool summers) as part of Quilt Camp. I went last year and took two classes with Laura Wasilowski, which were very fun (but the projects I started there are still unfinished, sigh). Weeks & Bill each teach different portions of this five-day class during which you will learn the essential skills for designing original quilts. You will learn to analyze color, determine the right proportions for your design, figure out how the right fabric combinations will reinforce your ideas and understand how to make quilts that are expressive of who you are. Through both group critiques and one-on-one discussions, you will be coached step-by-step through the design process. Whether you’re an experienced designer or have never had an art class, you will leave this class with the confidence and skills to design the quilt of your dreams. Doesn't that sound interesting? I really need help with the analyzing color part, and, well, everything else too. I can't wait! I've been having fun with this project, the flowers are easy to make and so pretty. I love how they just burst out from the center with all that color. I found this project in Wondertime magazine. Have you seen this mag? I enjoy reading the articles, I find them to be thoughtful looks at living with children. And the crafts are fun too. (By the way, I happen to have an extra copy of the current issue, if you'd like to swap something for it, let me know. I'm flexible, another magazine, some trim, ...) And if we're on the topic of child-related magazines--which I really didn't intend to be--my other favorite is Brain, Child. I can sit and read this one cover to cover. I like that they pick a controversial topic and present two opposing views. And that they include fiction, and essays from parents. Does anyone have any other favorite parenting magazines that I'm missing? OK back to the tutorial. Here's what I've made using this technique. It's destined to be a front pocket on a tote bag. I think it would also make a nice mini quilt. 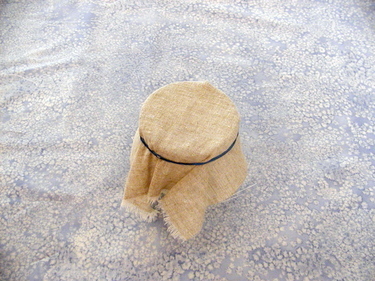 A piece of fabric (or a t-shirt), in a fabric that wicks well. This is linen which works like gangbusters. 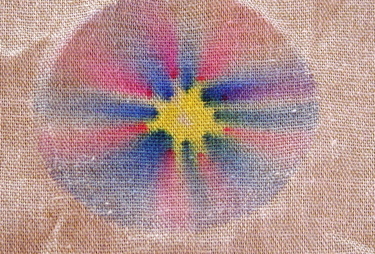 I've also tried some random cotton/poly blend that I had in my stash; it also worked, but there wasn't as much color movement and some of it was strangely constrained by the grain of the fabric. A light color is essential. I've done this on denim too, but that shows only a hint of color. A glass and an elastic band. Sharpie markers. Presumably you can also use other types of permanent markers, but these are the only ones I've tried. 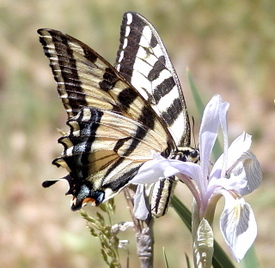 An eyedropper. I've also used a medicine dispenser, you know the type with the plunger. The eyedropper works better, but it's not critical. You could probably also use a straw that you keep one finger on the end of to keep the alcohol in. 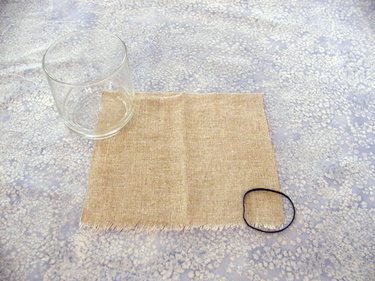 To get started, just put your fabric over the glass and secure it with the rubber band. Try to get the top surface fairly flat and taut. Next, draw dots on your fabric. 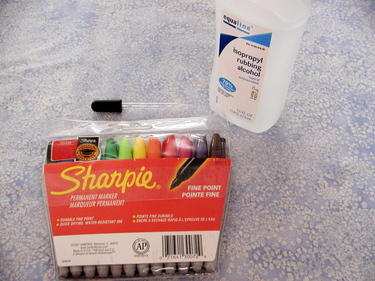 The rubbing alcohol is a solvent for the sharpie marker and will carry the color outward, so drawing a group of dots near the center works best. I like putting rings of different colors down, or you can mix colors around. Keep in mind that as colors are carried through other colors, they will combine and you'll end up with more colors than you started with. Pick up some rubbing alcohol in your eyedropper and drop some into the center of your design. Keep dropping until there's "enough." I put about a half eyedropper full of rubbing alcohol on this design. You want enough to wet the fabric all the way to the edge of the glass, or to wherever you want your design to end. If there's too much, the extra will just drip down into the glass, or it may carry the colors a bit over the edge. If there's not enough, the colors won't spread too far. Now you just need to wait for the rubbing alcohol to carry the colors out. This photo sequence took about 15 minutes. Let the fabric dry, then heat set it (hot iron with pressing cloth, or 20 minutes in the dryer) and then your new design is safe for washing. It's a bit difficult to show here, but you can sort of see where the yellow and blue have blended to make green in a few places, and blue + red made purple. If I had overlapped the dots more I would have had more blended colors. In the magazine, they suggested using the Sharpie to draw a stem to make a flower. 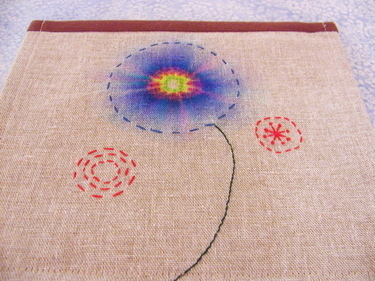 I thought I would try embroidery instead, for the stem, to outline the flower, and to add some punch with a few other random spots. 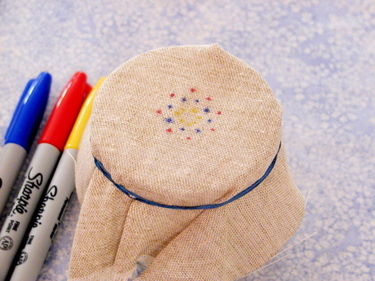 You can draw your design on in washable marker, then embroider over it. 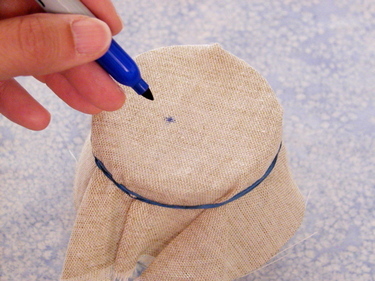 Or if you're like me and your washable marker has gone missing, you can draw a circle onto a piece of tracing paper, pin it onto the flower, and embroider through the paper. Then just tear the paper off when you're done. I did the stem and smaller circles freehand (getting brave!). Well, I finished the pajama bag earlier this week. 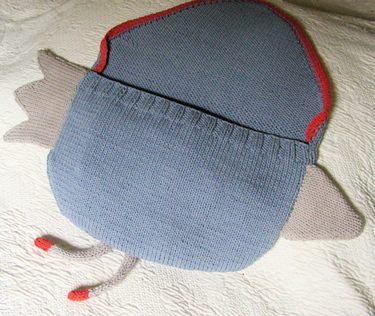 It took me about 5 days of knitting to finish it, and in that time I did not become convinced of the need for a pajama bag. 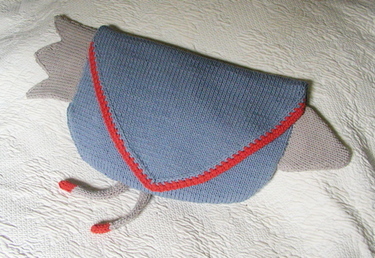 So I think I'm going to try to turn it into a shoulder bag or something like that. But it's a bit big for a little kid, it's about 12 inches across, not counting beak and tail. Does anyone have any other ideas for what could be done with this? It was an easy project, the directions were simple to follow and straight-forward. 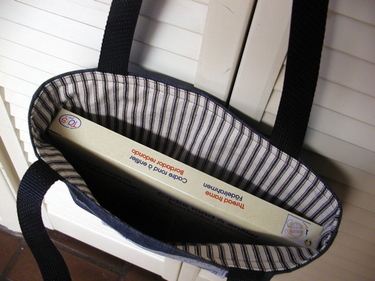 My only complaint about them is that the book did not show a back view, so I had no idea how the flap was going to turn out. So here are front and back views, for posterity or something. Most of my recent knitting has been of my own design, and with that I take time to stop and let the project rest, to think if this is turning out the way I want it to, to daydream about what it's going to look like when it's finished. In the past, doing my own knitting designs has frustrated me because it sometimes takes so long and is so fluid (I don't know how it's going to be in the end). And so I really thought I would like working from a pattern. But last week, I felt differently about it. 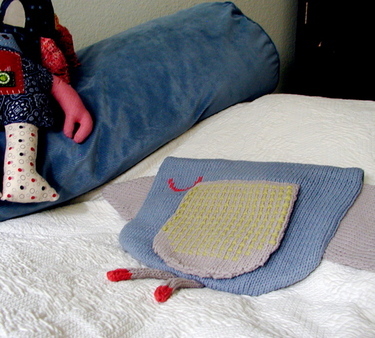 I fondly remembered those uncertain moments of knitting rest, the thinking and changing and more planning. 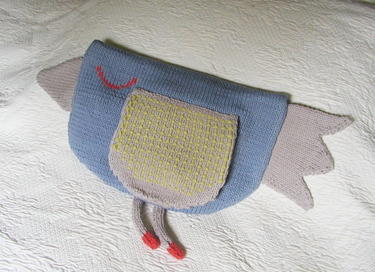 All while furiously knitting so I could finish this bird. Weird.